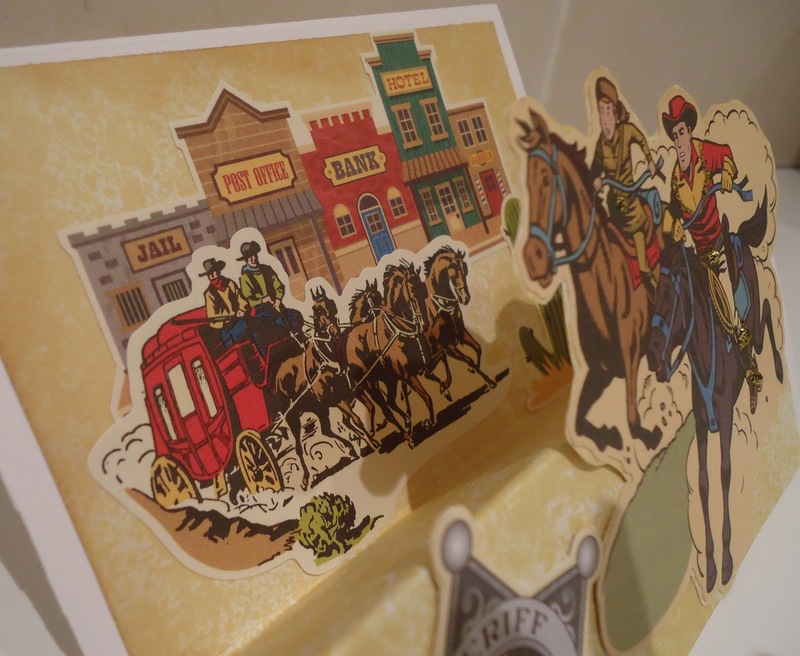 Little Red Wagon 's latest challenge is 'jars', so it's a great excuse to use my Stampin Up Perfectly Preserved set. I've only ever used it once before on this Halloween card. I stamped using Mustard Seed Distress Ink on the jar and Spiced Marmalade on the sentiment . The buttons, ribbon and paterned papers are all by Docrafts/Papermania. This image is from A Day for Daisies and I think it would work in any colour scheme, but I tried to go a bit dramatic. I coloured the background behind the shoes with a Promarker, embossed it, cut it out and paper-pieced it onto another copy of the image. I coloured in the rest of the image and then paper-pieced the shoes. 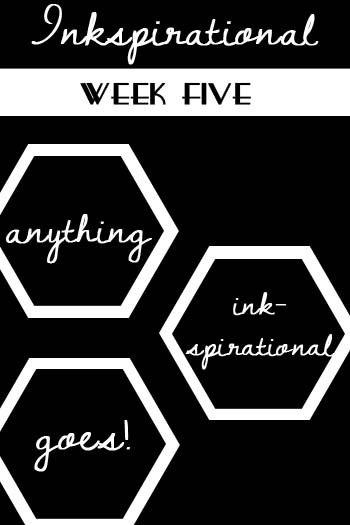 It's Anything Goes this week at Inkspirational Challenges! I was originally going to use this A Day for Daisies image for the Inkspirational first challenge - kiwi, black and dark pink. Below, you can see my 'notes' for this...and I decided that, although I'd keep green, pink and black , the shades needed to be lighter. 'Anything Goes' is such an easy challenge to join in with ; this is the perfect time for you to come over to Inkspirational . 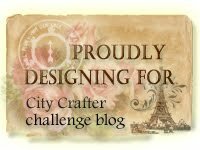 I think you'll find it a friendly challenge blog and hopefully, you'll come back every week. I bet you think this took me two minutes to make! Not at all. The less that goes on a card, the longer it seems to take me to get it right. I hope I have got it right! 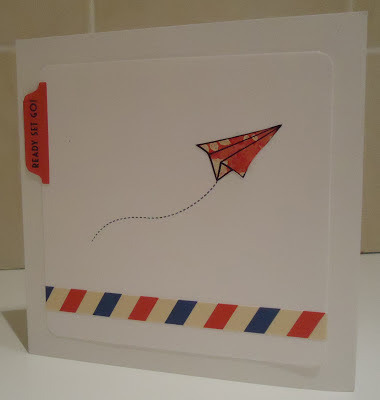 I thought this would make a nice 'Bon Voyage' card. The paper plane and trail are by Lawn Fawn and I just bought them. 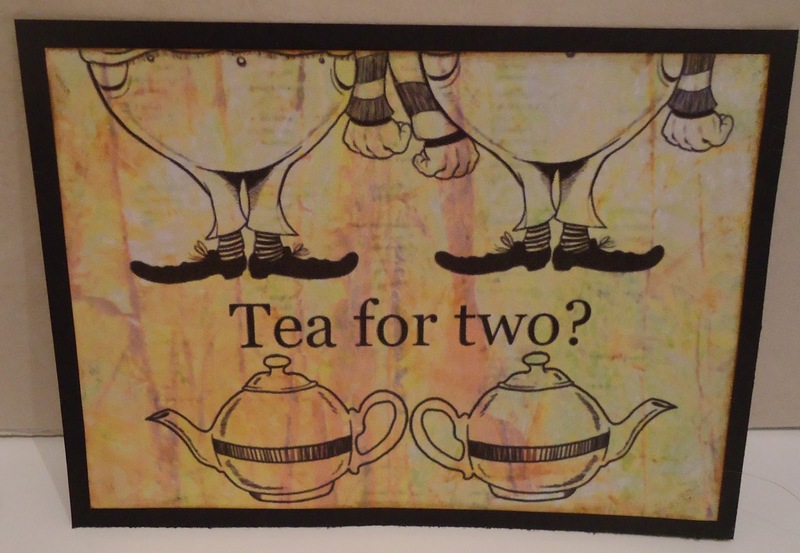 The tab and stripe, on the other hand , have been hanging around for ages. They are from an October Afternoon 'Boarding Pass' sticker sheet. 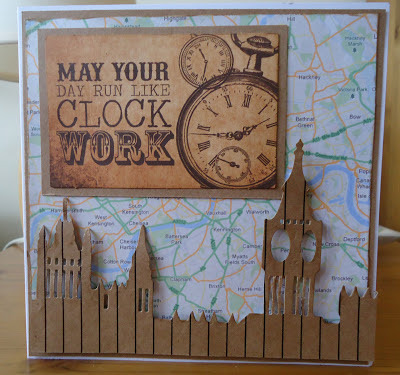 My ideas came together here from various sources - the large die cut sentiment from my Docrafts Goody Bag, some challenge themes 'time' and 'maps', and my newly purchased Xcut London die set. 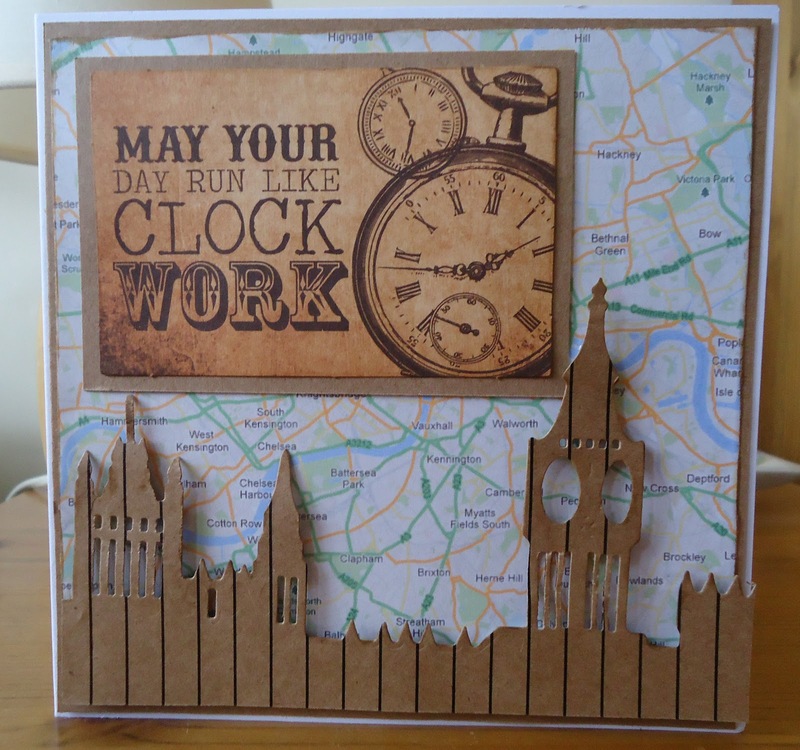 I cut Big Ben out from lined kraft card, to give the effect of office stationary and pinstriped suits. (Well, that was the plan!) I googled a map of central London and printed it out. 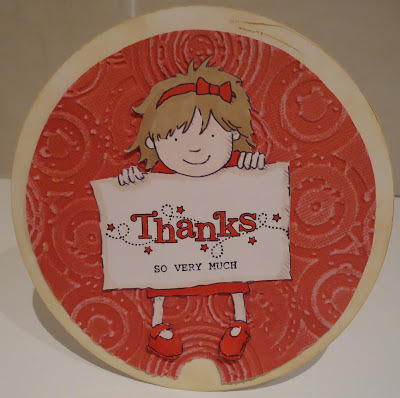 This week's CD Sunday challenge is 'Hello Doily '. I have a pack of doilies somewhere but a thorough search of my craft room has merely resulted in an even messier than usual craft-room! So I had to go for a digital doily. 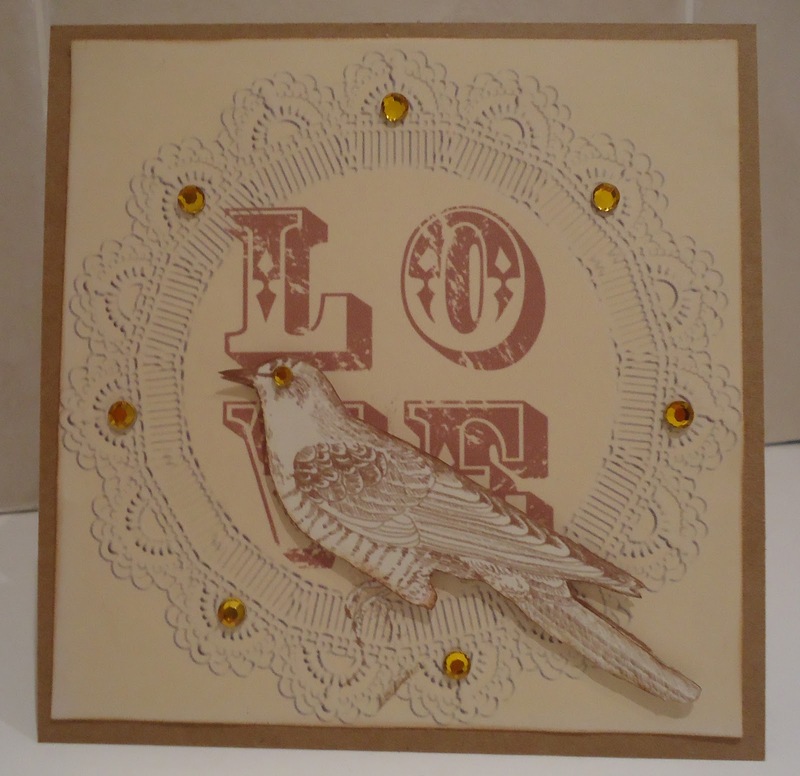 The card was made using elements from My Craft Studio 'Quntessential Country Garden' CD - the doily, the 'LOVE' and the bird. I printed the bird twice, inked one and stuck it on with 3d foam. I added gems and stuck it all the cardstock. 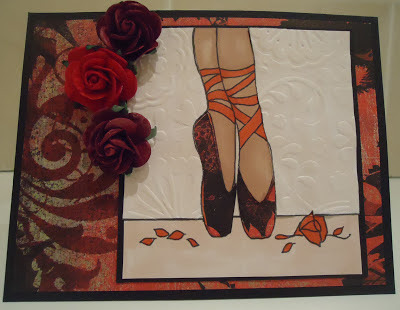 I'd also like to enter this for the 'Love' challenge at Artistic Inspirations. Well, once again I have succumbed to the temptation of the Docrafts Goody Bag and am now wondering what to do with it all. 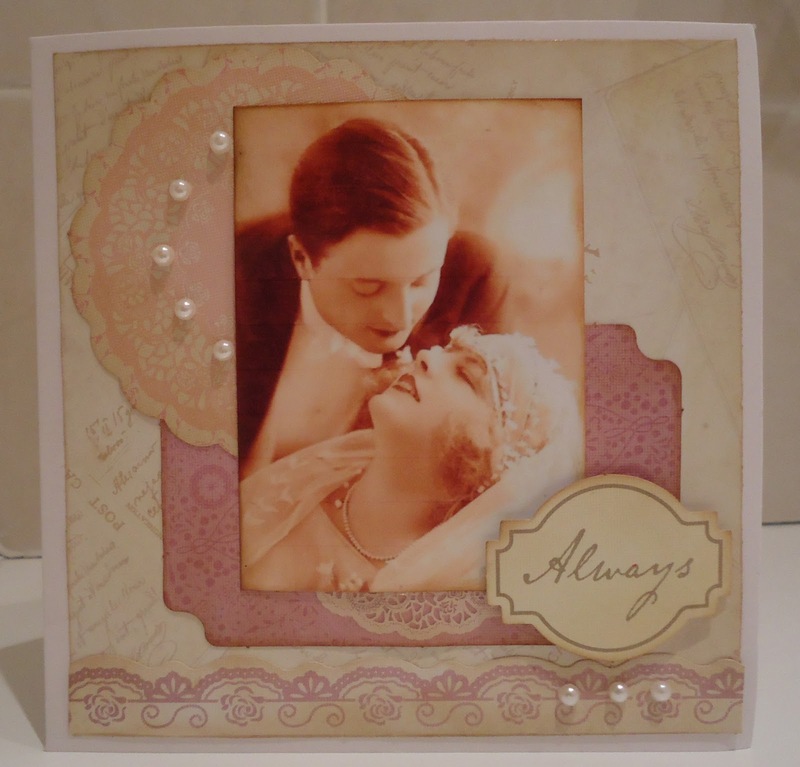 There are lots of diecut shapes and sentiments from their 'Vintage Notes' range and I've used 4 of them here. The first thing I did was slap a load of ink (Antique Linen and Vintage Photo) over them, as they were too bright for what I wanted. The vintage photo is from Eclectic Images. If you like vintage photos, Eclectic Images will be sponsoring Inkspirational Challenges in February. When I first saw the sketch , I thought 'oh no, it's sentiment as focal point': a style I admire from others but rarely do myself. Then I hit on the idea of letting this cute character from Jellypark hold the sentiment. The sentiment is two stamps from a Stampin Up set. I tried to give the whole card a slightly worn, distressed look by inking and sanding. Why not join in at Inkspirational Challenges this week? 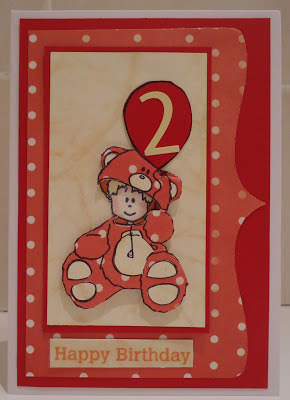 I'm still making birthday cards for little boys - this one is for my nephew who will be two. 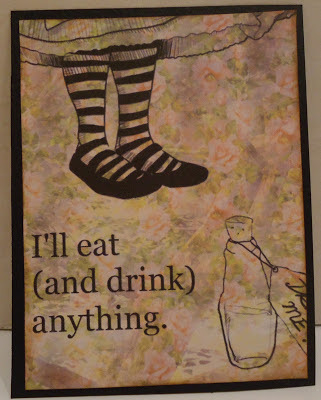 This was made entirely from stuff I've had hanging around for years , except for the edge die which is new. 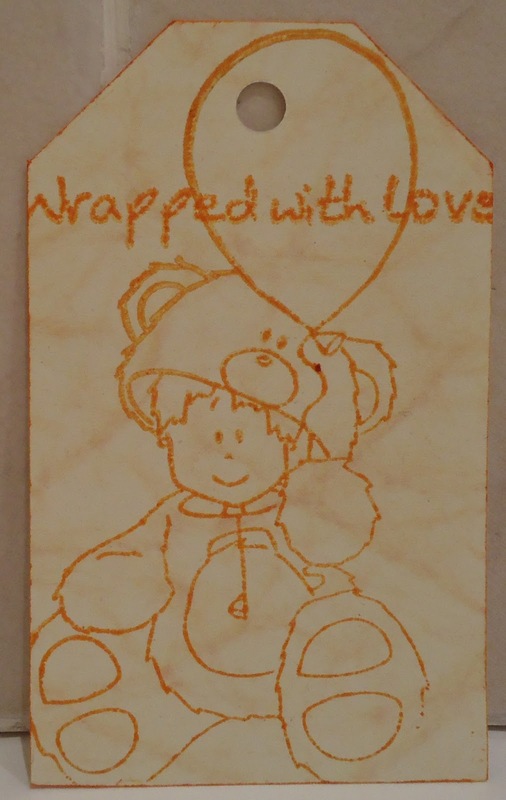 The stamp and papers were all from Do-crafts goody bags from years ago. I paper pieced the bear suit and stuck it onto the image using 3d foam. Matching tag for his present . Use your stuff Birthday theme. This is a birthday card for my son who is 6 on Saturday. 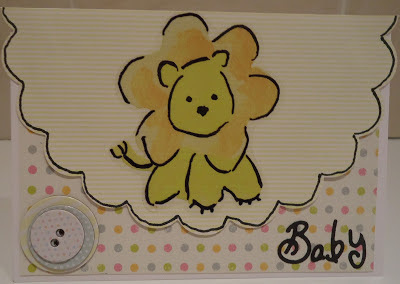 I used an October Afternoon sticker sheet I got ages ago plus cardstock and glitter glue. 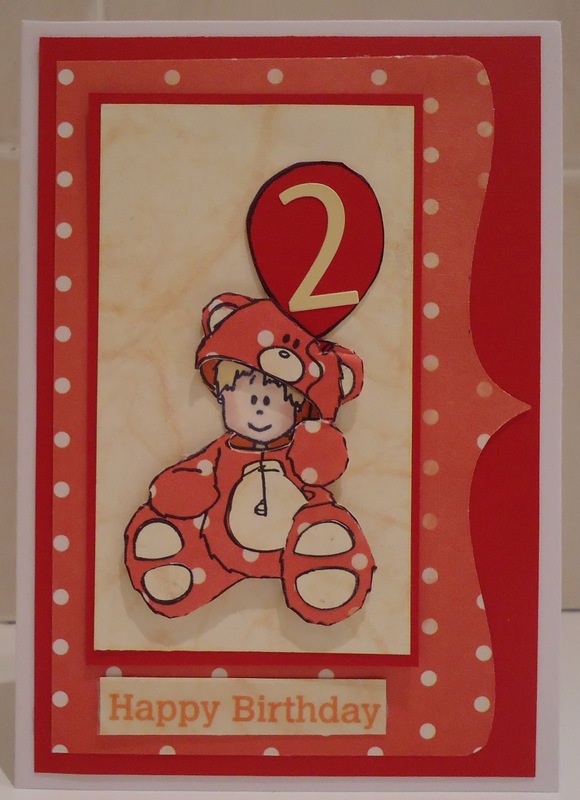 It looks quick and easy I know, but I actually worked on it for ages to get the layout/ card shape right. Yeehaw! I've been playing around and made a tag, inspired by those tags you get when you buy not-cheap clothing. I guess these little details are what you pay for but I love those fancy labels. The 'flowers' were made by stamping stems and then topping them with circular stamps - the heart circle is Stampin Up and the others are (I think) Fiskars. Then I mounted the tag onto denim paper (Joanna Sheen CD) and added hearts ,(punched from the same paper), twine and a button. CD Sunday's challenge this week is 'Forever in Blue Jeans' . 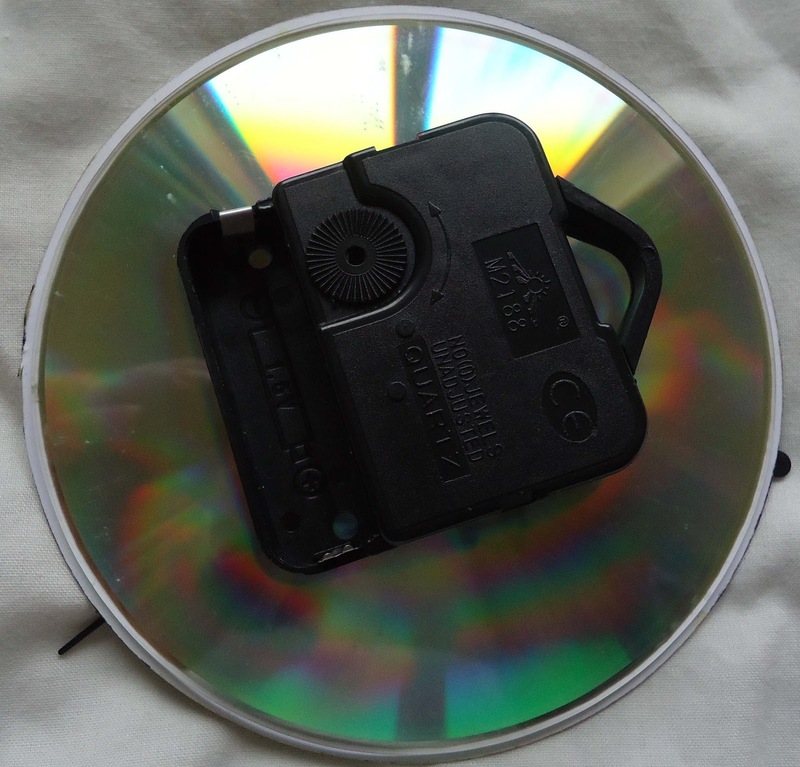 At first I thought I didn't have anything suitable but them I remembered that right by the image I used on last week's entry to CD Sunday(from My Craft Studio Encyclopedia ) , were some 50s images. I placed the music collage (from Polkadoodles Not for Girls CD) behind the man and printed onto paper from Basic Grey 'Obscure'. 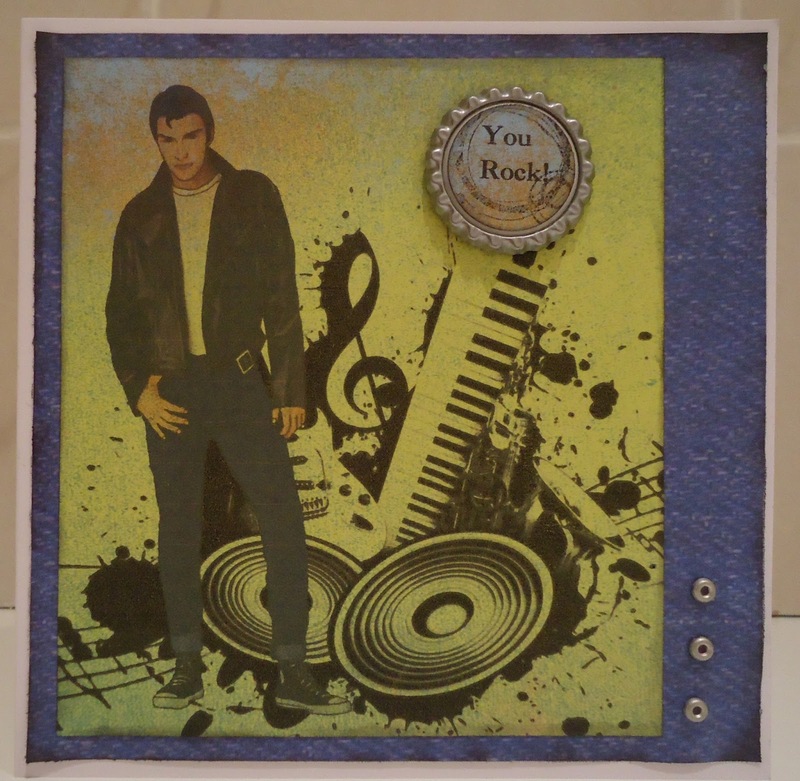 The denim paper is from Joanna Sheen Fashion Boutique CD. I will straightaway confess to having stolen this idea from Crafty Tess who has made a fabulous layout and credited the CD - otherwise I wouldn't have realised it was on there. I hope she doesn't mind. I added eyelets and a flattened bottle cap into which I put the sentiment. I typed 'you rock! ' on my PC, printed and punched it out and added a stamped grungy circle. It's snowing here at the moment. Earlier, I threw some bread onto the patio and two robins flew down for breakfast. This image is by A Day for Daisies. 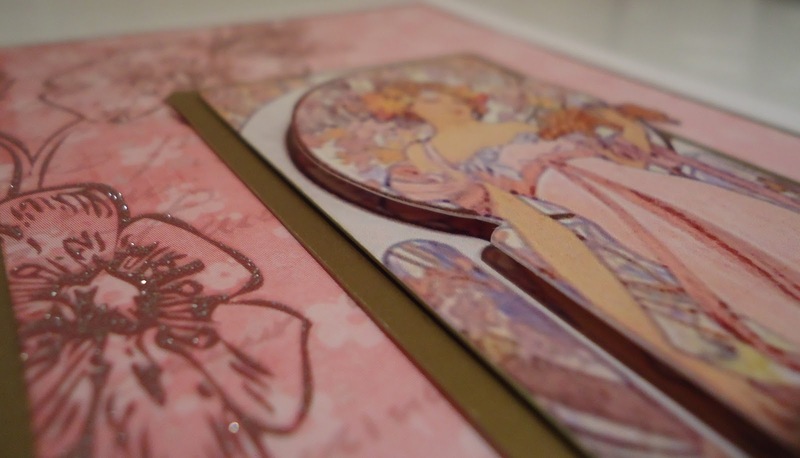 The patterned paper is by Kaisercraft and I used liquid pearls, Promarkers, red mirror card, patterned vellum and a sentiment stamp. The main image is popped up on 3d foam. 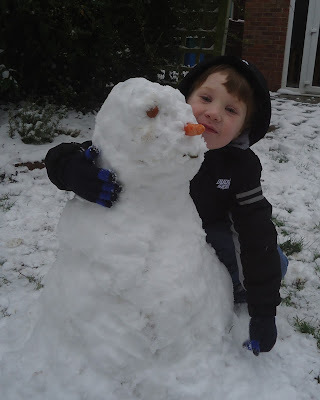 We really did build a snowman! See the picture below. 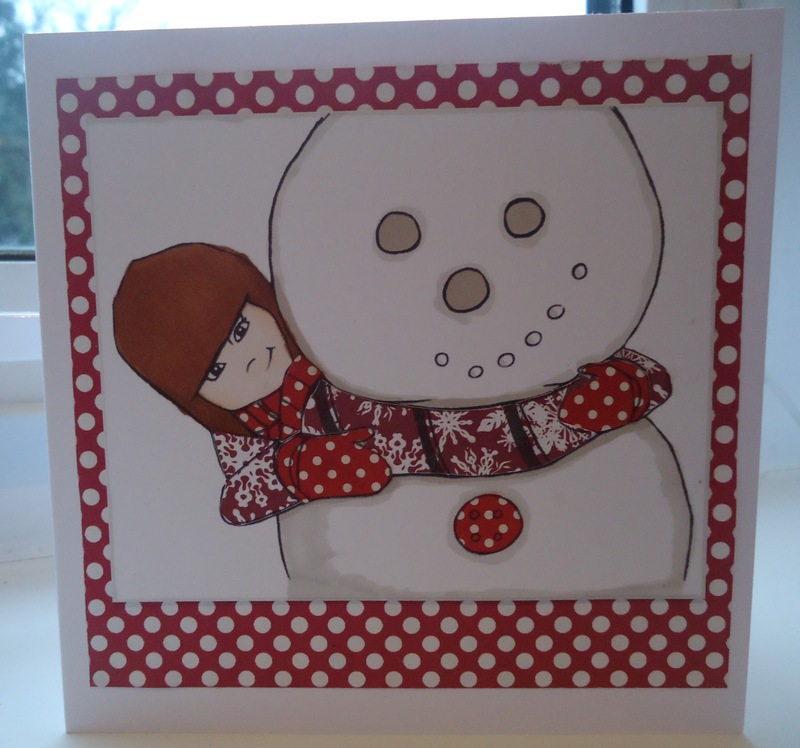 (Snowman looks a bit grumpy, so he'll fit right into my family.) 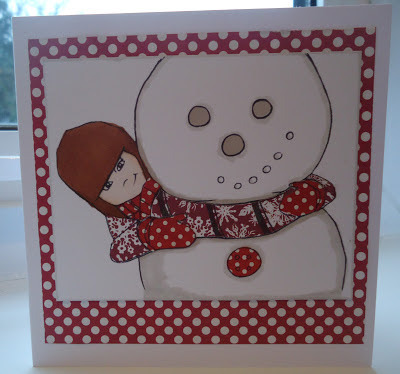 Then I made a snowman card. 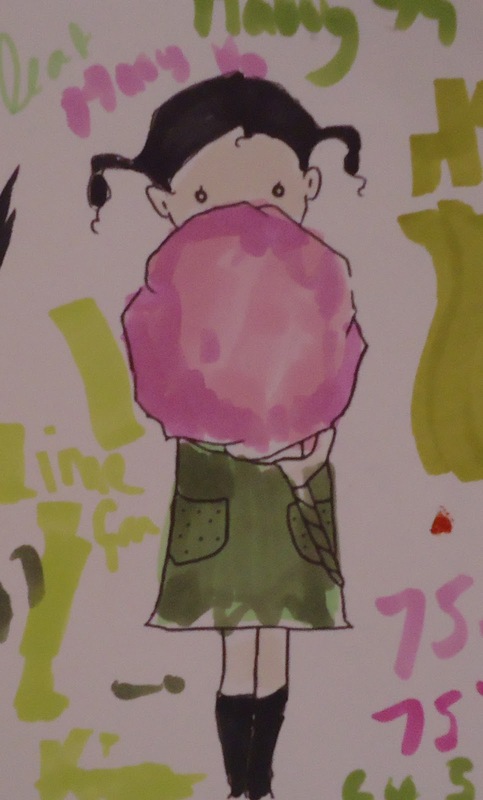 This is a new image from A Day for Daisies and all I did was colour with Promarkers and paper-piece with scraps. I will use it as a Christmas card. I think a Christmas card this early must be a personal record! Well, I was delighted when the Principal of the college where I work said we were closing early and could go home at 3! But then I really did have a long and difficult journey home and fell over twice in the snow! Never mind, I can enjoy the winter wonderland tomorrow from the comfort of home. This card is a bit sunnier than England, I hope. The large image is from an unidentified brand stamp - I know I got it very cheaply on a special offfer. 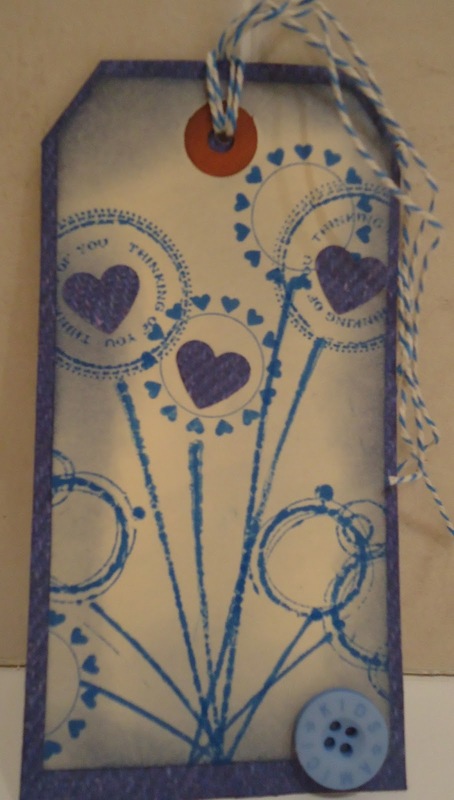 The sentiment is Debbi Moore, and the tag and koi are Debbi Moore stamps. 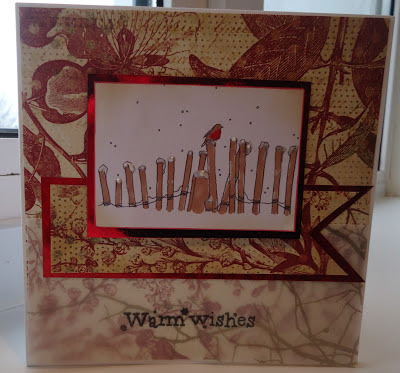 I've got to confess...until I entered the Inkspirational design team call, I'd never CASEd a card - I wasn't even sure what it meant! This is what I learnt - it's using someone else's card for inspiration. It shouldn't be a total copy, just a few elements, like the colours, the layout etc. 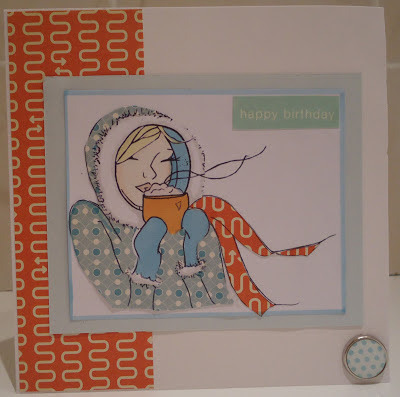 This beautiful card by Victoria Jeffries has a Clean and Simple style, but is actually extremely skilled. My version is less skilled! 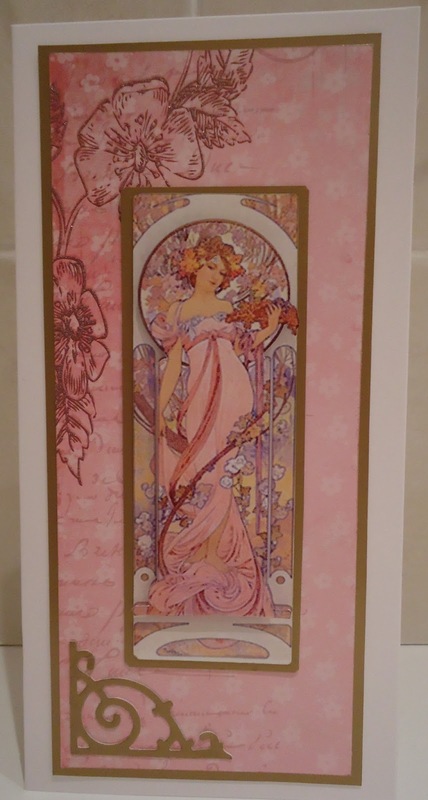 I tried to keep the proportions of coloured card to stamped image, but changed the shape slightly and rounded my edges as in Victoria's card. 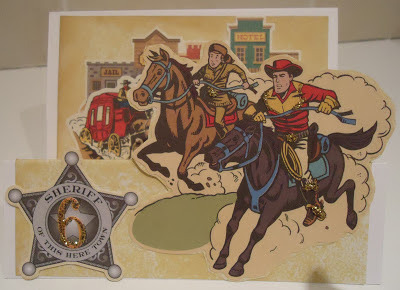 I embossed Coredinations cardstock with a Sizzix folder and sanded it. The birds are a digi stamp from A Day for Daisies, who are our sponsors this month. 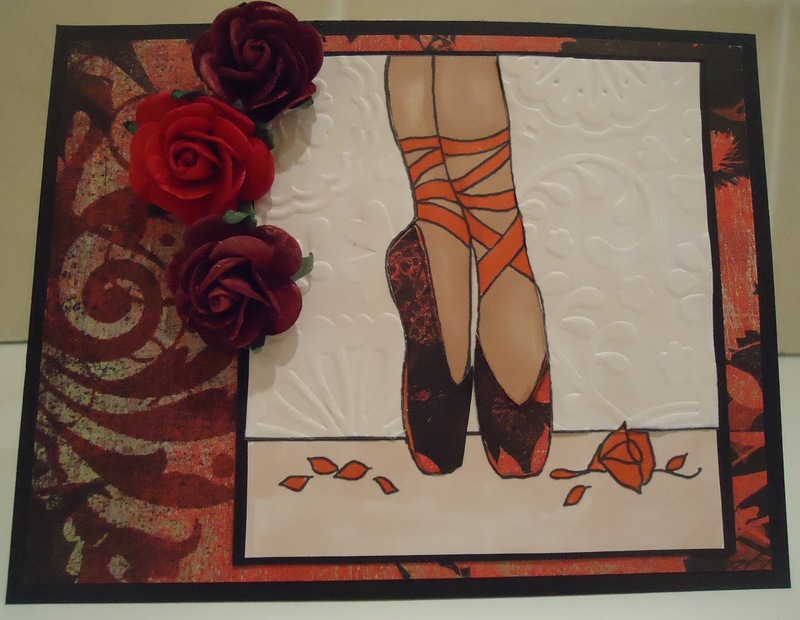 Please join us at Inkspirational Challenges and show us how Victoria's card inkspires you. 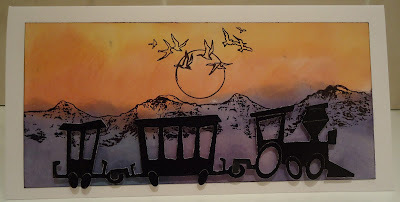 I've only ever used this Sizzix train die once - for a kid's card, and wondered if there was anything else I could do with it. I had fun inking my background and stamping the mountains and the setting sun with the birds. Both these stamps are very old. Everyone in England seems to be very excited today about the snow that's forecast. We must look quite silly to many of our friends abroad who are used to heavy snow! My main worry is that I'll make it into work tomorrow and not get back home....must take a clean pair of knickers with me just in case I have to sleep at my desk!! 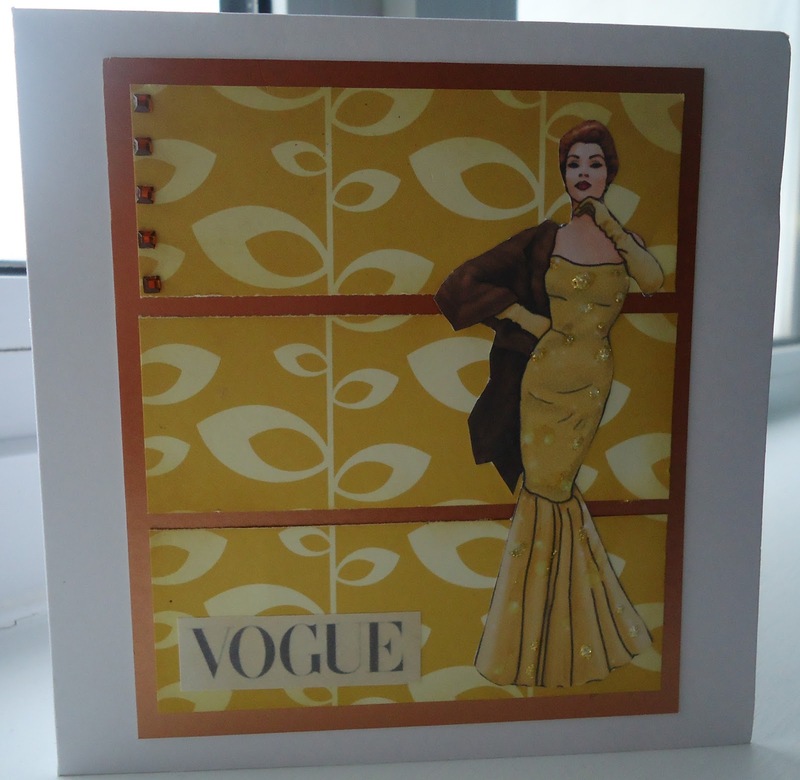 This week's CD Sunday challenge is Vintage Vogue. This glamourous woman comes from My Craft Studio Encyclopedia of Card Templates and Folds. I used the sketch from Feeling Sketchy. 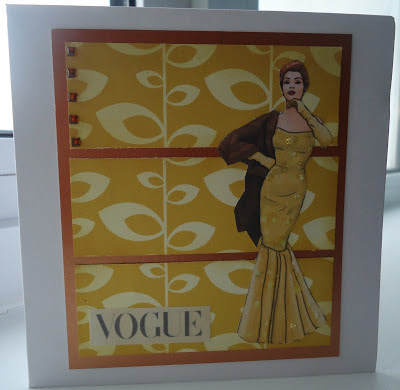 The patterned paper is by Cosmo Cricket and I found the Vogue logo on the internet, printed it and dabbed it with ink. I added glitter to the dress and 5 square gems. You may be wondering why I chose these garish greens for this card. Well really, they chose me. I was just playing around with a new 'Mowed Lawn' Distress Ink Pad and liked the mottled effect, particularly when I stamped over it. This card is for the Out of a Hat Creations Hatter's Bingo challenge. The line I've chosen is - hat/stamp/text/buttons. This is my second Design Team card for Inkspirational Challenges . 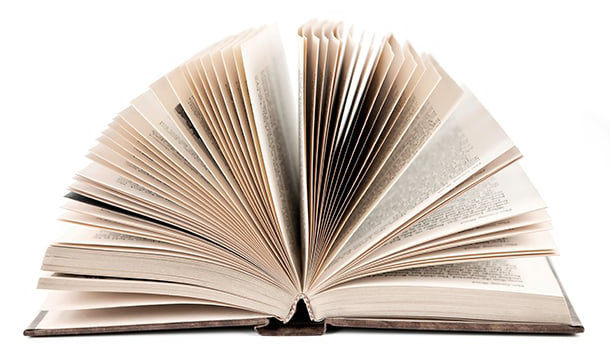 This image was kindly provided by A Day For Daisies , who are our sponsor this month. Immediately I saw the photo inspiration, I thought of fairytales. 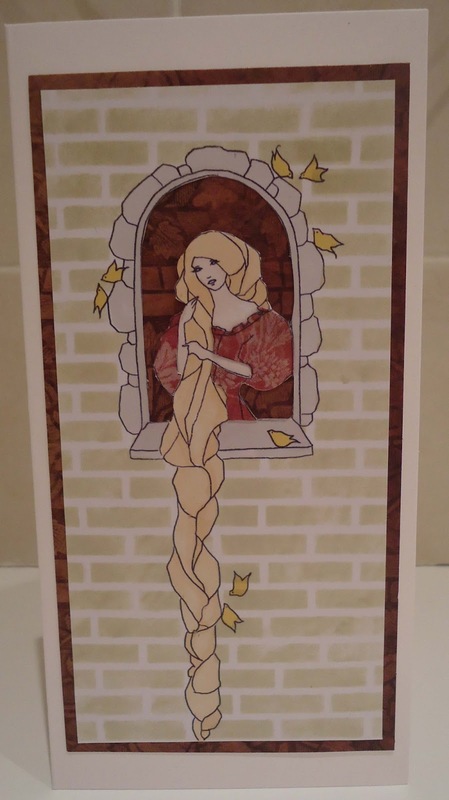 Here is Rapunzel letting down her long hair so her prince can join her in the tower. 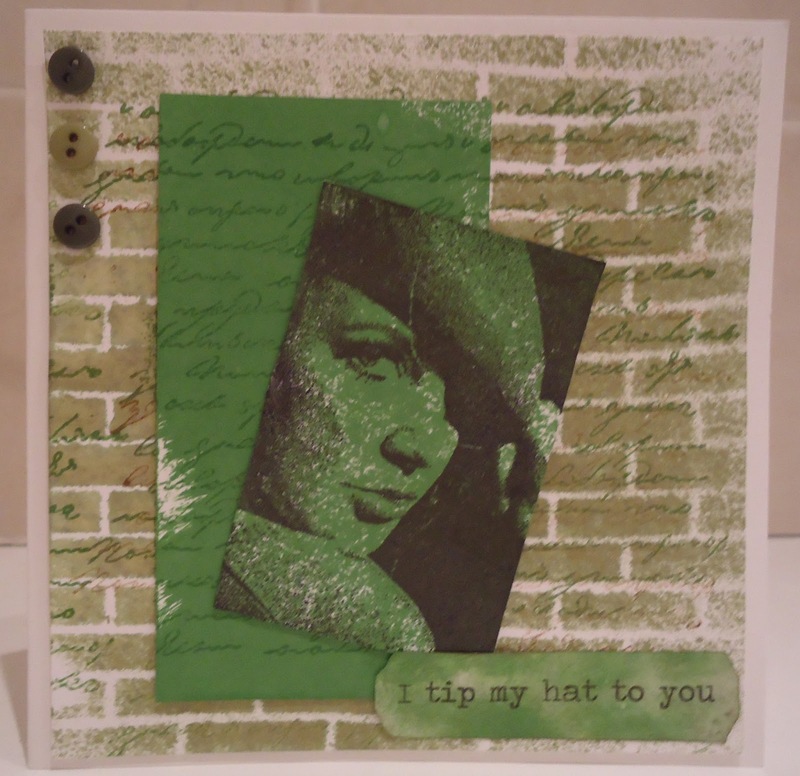 I printed the image onto card , masked it and created a background with my favourite Stamposaurus brick stencil and sponged ink. I took of the mask and, using a scalpel (bravely, I think!) cut away the background inside the window and stuck it onto some patterned paper (from DCWV Once Upon a Time stack). 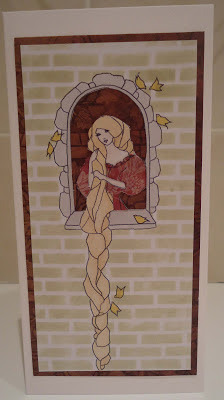 Then I coloured the window, birds and Rapunzel with Promarkers and paper-pieced her dress. I hope you like it and I hope you will come and join us at Inkspirational Challenges. I'd also like to enter this for the 'Create a Fairytale Scene ' challenge at Crafty Cardmakers . This is a new image form A Day for Daisies. 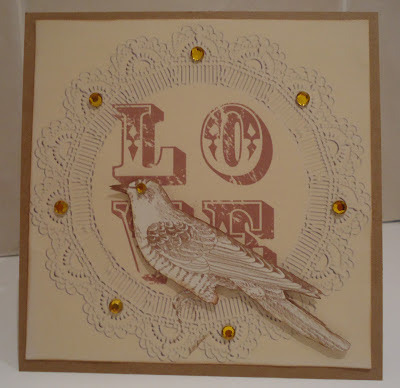 For my colour scheme I was inspired by the photo inspiration at Stampin' Royalty. 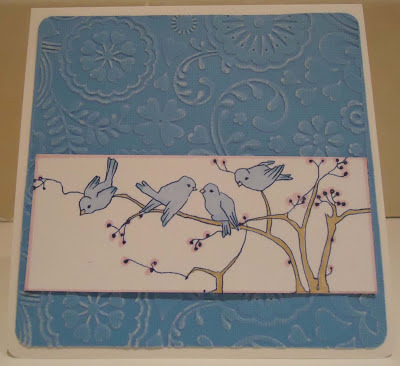 This stamp, by Stamps Happen, is another oldie but goodie - I've had it for years and used it lots. 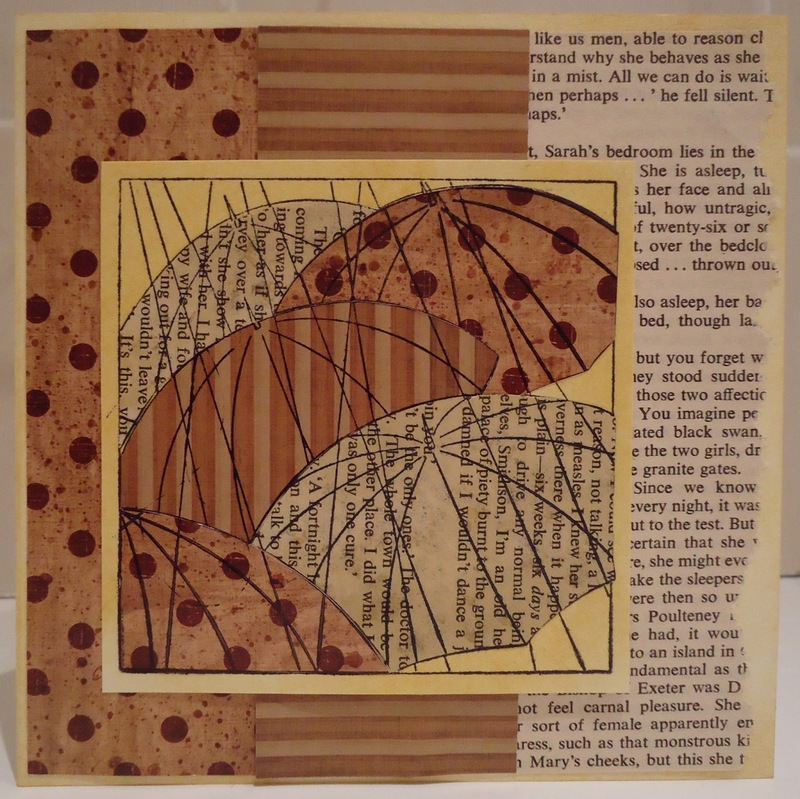 Here I've paper pieced it using pages from a collapsed novel and patterned paper scraps. 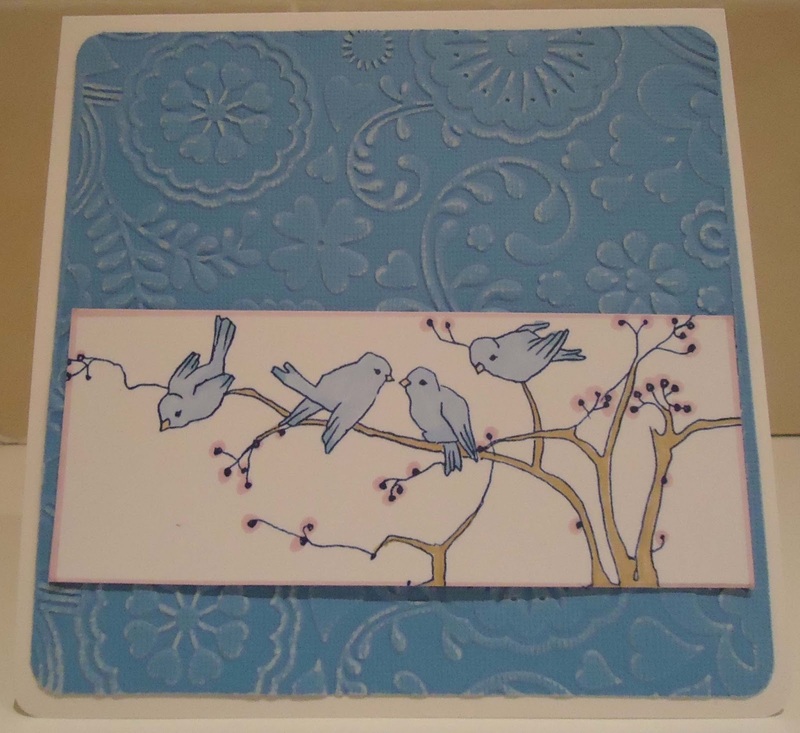 I'd like to enter this for the 'Book Paper' challenge at City Crafter. Just a quick post to remind you that the second Inkspirational Challenge is now on, using this picture inspiration. Why not join in? Don't forget we have a fabulous follower giveaway too. My Design Team project will be posted on Saturday in the End of the Week Encouragement post, so please pop back and take a look. I cut out the centre of the image and layered it onto another copy , using 3d foam. The background paper is from a My Paper Stash pad that came with a My Craft Studio CD. It has a bit of sheen on the flower. 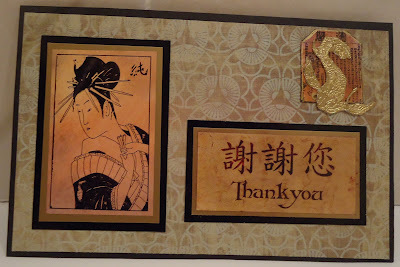 I mounted everything onto dull gold and added a Sizzix die cut corner. 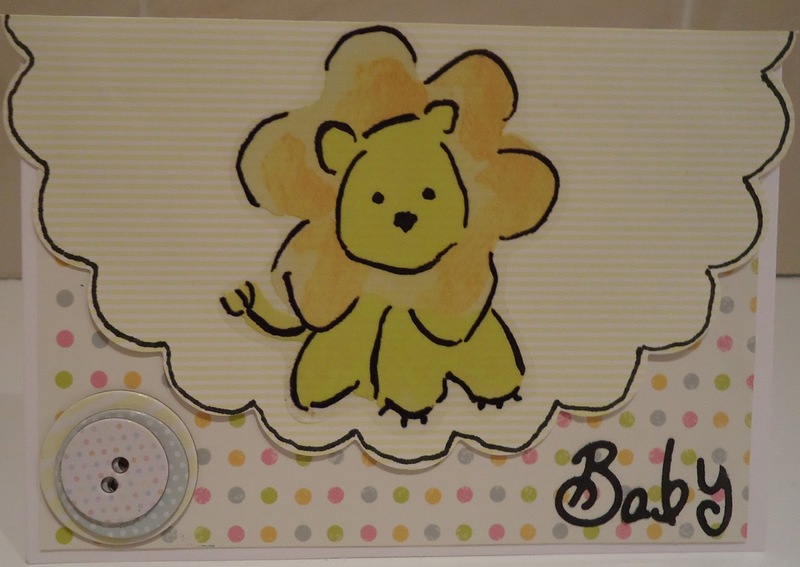 I'm still building up my stock of new baby cards. The lion image is a sticker from a Paper Adventures sheet I bought in 2005! The spotty cs in the background was from my scrap box and the lettering is Sizzix die-cuts. The scalloped die-cut card and the cardboard buttons are from a new Do-Crafts Goody Bag. I drew a wobbly border round the scallops and stacked the buttons up. 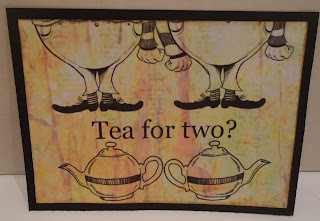 Guess Who's Coming to The Tea Party? Out of a Hat Creations have a fun challenge this week. 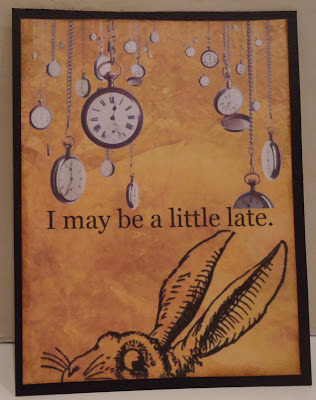 They’ve issued an invitation to the Mad Hatter’s tea party and they want to see your reply. I used My Craft Studio ‘A Very important Date’ to make these replies. I played around combining images and cropping some of them off the page. I used the ‘add text’ feature to write their response. 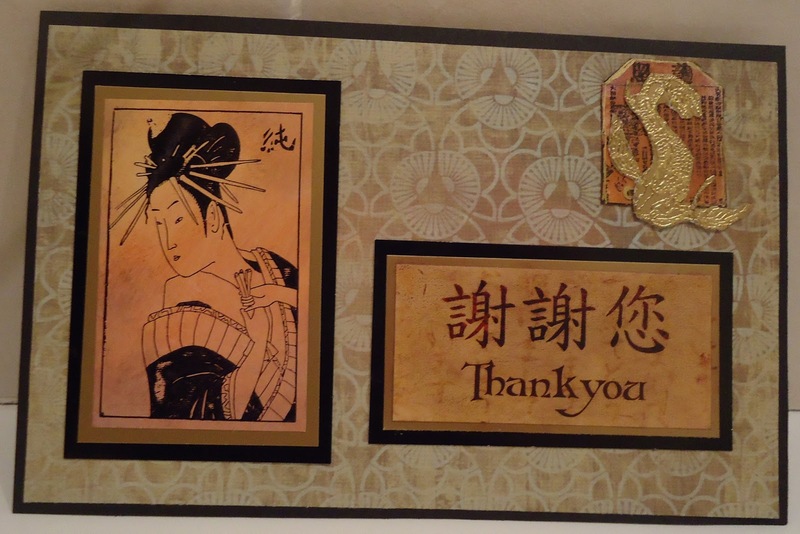 Then I printed out, inked the edges and mounted onto black card. Quick(ish) and easy, I know, but I hope you like them. The First Inkspirational Challenge ! 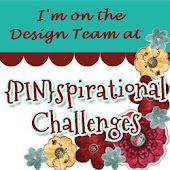 Today I nervously present my first Design Team project for the new Inkspirational Challenge Blog. 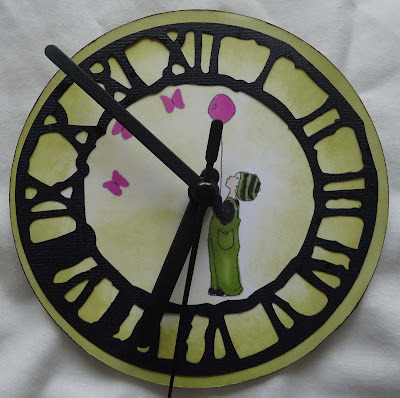 My project is a working clock using images from A Day for Daisies who are sponsoring the challenge this month. I used a Sizzix die for the clock face and a cheap battery powered mechanism with hands included. I used a CD on the back to give it more substance. Please come over to Inkspirational and join in. We have a giveaway going on with lots of great prizes, so don't miss out! 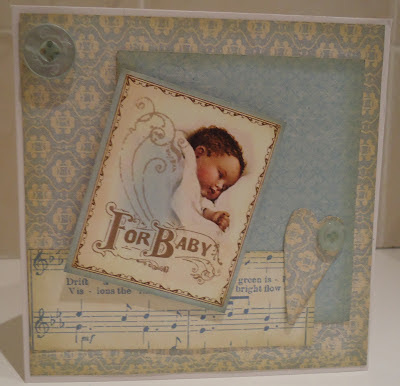 I always need new baby cards, so when I saw the Vintage Boy (or Girl) challenge at City Crafter, I wanted to join in. The image and the strip of music paper are Graphic 45 and the other papers are by K and Company. I used a sketch from Feeling Sketchy and I finished off by embellishing in my usual restrained style. 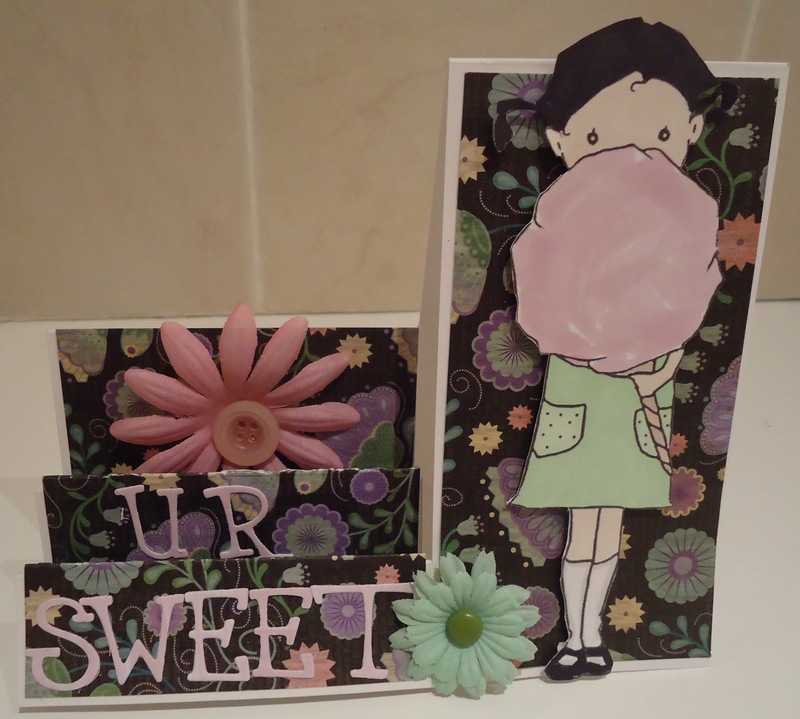 No honestly, that's my trademark ...not just that I can't do embellishing!!! So, I go to bed, over-full from leftover festive food and drink, not looking forward to going back to work tomorrow , but excited about the new challenge blog which starts tomorrow and where I am on the design team. Please join us at Inkspirational Challenges and follow us for a chance to win a prize in our giveaway.